One of the best ways to create memories that will be treasured forever is on a hot air balloon tour over Melbourne. From picture perfect panoramic views to sharing magical moments with that special someone, there are plenty of reasons why a hot air balloon ride should make your bucket list. We give you 5 of the most common reasons why we love the thrill of hot air ballooning to inspire your sense of adventure. Is there any other scene that better brings together romance, adventure, fun and excitement than a hot air balloon ride? Maybe you’re looking for a special way to propose? What better way to pop the question and celebrate love than by floating gently across the spectacular Melbourne horizon? We’re sure the stunning views of iconic Melbourne from thousands of feet above the ground will bring out the inner amateur photographer in you. Imagine the amazing perspective a 360-degree vantage point provides. This could be the start of a whole new love affair with you upgrading your interest in photography. A fear of heights is one of the more common phobias many people face. If this is one of your fears, a hot air balloon ride is one of the best ways to face this fear. Hot air balloons rise and float gently and slowly, there is absolutely no sensation of movement, as we are moving with the wind, minimising any uncomfortable sensations similar, to motion sickness, there is none of this whatsoever. It’s not anything like being near the edge of a cliff or a tall building, as there is no fixed point of reference, so there is never a real fear of height experienced. One of the most critical factors that make for a pleasurable hot air ballooning experience is to choose an experienced tour company. Pilots and guides should be friendly and knowledgeable and thus able to provide the ultimate experience. Chief Pilot, Chris Shorten aka BalloonMan has over 24 years’ experience flying hot air balloons over Melbourne. His knowledge of Melbourne from the air is second to none. 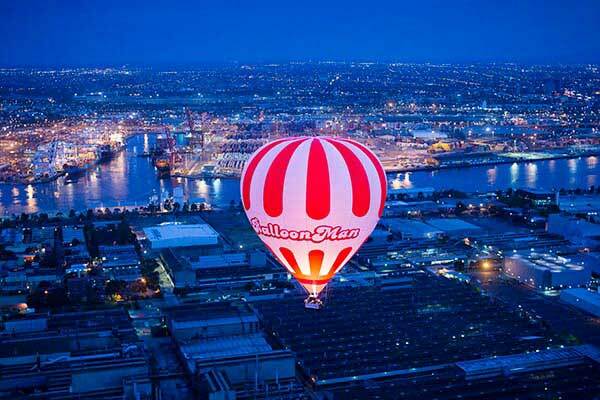 Even Melbourne locals are sure to learn something new about their hometown, when they come fly with BalloonMan. Children from as young as six (6) years old can enjoy a hot air balloon ride over Melbourne, of course they need be tall enough to look over the basket. Say YES to the adventure of a lifetime. Book a hot air balloon tour in Melbourne with BalloonMan. You will love our professionalism and passion for hot air ballooning. At the end of your flight be sure and join us for the 5-Star Champagne Breakfast in Collins Kitchen at Grand Hyatt where we enjoy the luxury of our very own private dining room.